Posted on 22, August 2016 by EuropaWire PR Editors | This entry was posted in Business, Investment, Real Estate, United Kingdom and tagged Ballymore, Birmingham, Bruntwood, CEG, Ediston, GBR Phoenix Beard Holdings Ltd, L&G, M&G, Mark Ridley, property consultancy, Savills UK, Simon Farrant. Bookmark the permalink. BIRMINGHAM, 22-Aug-2016 — /EuropaWire/ — Savills UK has today (12 August 2016) announced the acquisition of property consultancy GBR Phoenix Beard Holdings Ltd. The combination of Savills and GBR Phoenix Beard will create a leading advisory firm in Birmingham, with a particularly strong position and client offering in property management, agency, building surveying and investment. With a reputation for providing high quality consultancy, property management, agency and transactional services, GBR Phoenix Beard is an independent, owner-managed business which operates nationally from offices in Birmingham, London and Leeds. Its specialist teams cover commercial property management, office and industrial agency, investment, residential management, building consultancy, lease consultancy, rating, and health and safety services. The firm manages properties across the UK on behalf of retained clients including Columbia Threadneedle Investments, Standard Life Investments, Calthorpe Estates, Wesleyan and Scarborough Group, whilst the award-winning office agency team acts for a diverse base of clients such as M&G, Ballymore, CEG, Bruntwood, L&G and Ediston. The practice employs 205 people, who will all join Savills with immediate effect, and is led by Managing Director, Simon Farrant, alongside Head of Property Management, Catherine Gabriel and Head of Agency, Stephen Benson. Savills Birmingham was established in 1998 and offers a full spectrum of services including: development; planning; urban design & masterplanning; office and industrial agency; investment; building consultancy; rating; strategic asset management; lease consultancy; commercial property management; management set-up; valuation and housing and healthcare. 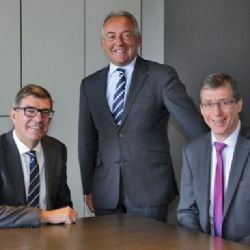 Savills and the GBR Phoenix Beard Birmingham teams will relocate to a new combined office in due course, while the GBR Phoenix Beard teams in London and Leeds will move into Savills existing offices at Margaret Street and City Point.